A highly advanced, multi-functional piece of malware dubbed VPNFilter is wreaking havoc on routers across the globe, especially targeting Ukraine. 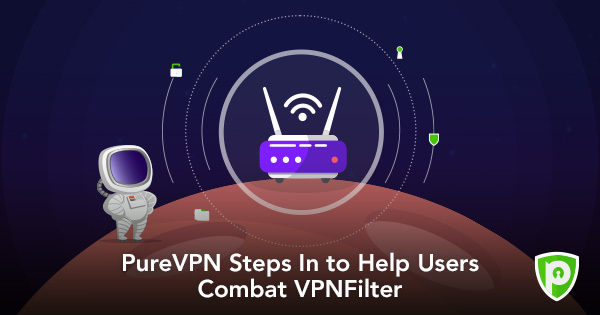 PureVPN urges internet users all over the world to use its Router Applet or configure PureVPN manually on their routers to defeat to the malware. HONG KONG, June 10, 2018	(Newswire.com) - Cisco’s Talos research division recently announced the existence of a malware dubbed VPNFilter that’s wreaking havoc on many different brands of routers all over the world, especially targeting routers in Ukraine. The recently made public announcement actually involves research dating back to 2016. The research and findings were made public in a haste, given the extremely destructive nature of the malware. While the malware is named VPNFilter by the researches, it had nothing to do with a VPN in actuality. If anything, a VPN is users’ best defense against this malware. The malware was discovered by Talos, Cisco’s research division, which has concluded that the malware is likely state-sponsored or is affiliated or sponsored by a state, most probably Russia. The VPNFilter malware is thought to have infected at least 500,000 devices in at least 54 countries as of now, but this figure is a conservative estimate given the destructive capability of the malware discovered after the researchers examined its code. The list of the brands of routers most susceptible to this malware is long, but fortunately, users can use a VPN service to combat this malware and stop it dead right in its tracks. Update the Firmware of your Router: Many brands of routers have released patched for their firmware. Users should immediately update the firmware of their router with the latest patch. Factory Reset your Router: This can be done by holding your router’s reset button for five to ten seconds and rebooting the router. Change the Password of your Router: This is a simple but critical step to be taken immediately. Turn off Remote Administration: Check your router’s settings to make sure you have Remote Administration turned off. PureVPN's limited time Buy One Gift One (B1G1) deal is ending soon. Send the free invite before time runs out! PureVPN's Buy One Gift One Deal gives users the perfect opportunity to cover all household devices with top-notch VPN protection. Public Wi-Fi leaves users' personal data vulnerable to theft. Take advantage of PureVPN's B1G1 deal and empower loved ones to stay safe on unsecured networks.